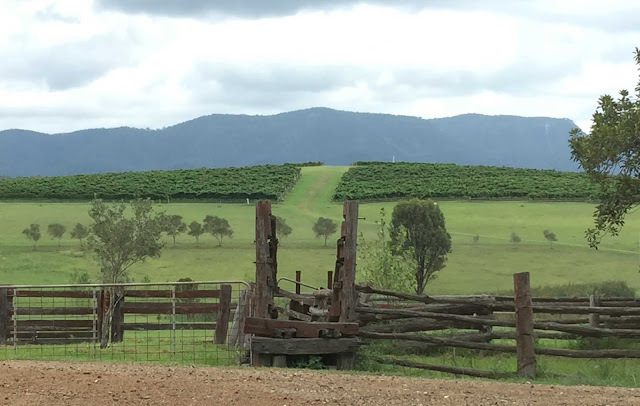 I have wanted to re-visit the Hunter Valley for a long time now. We had planned to visit 4 years ago, however the N.S.W. 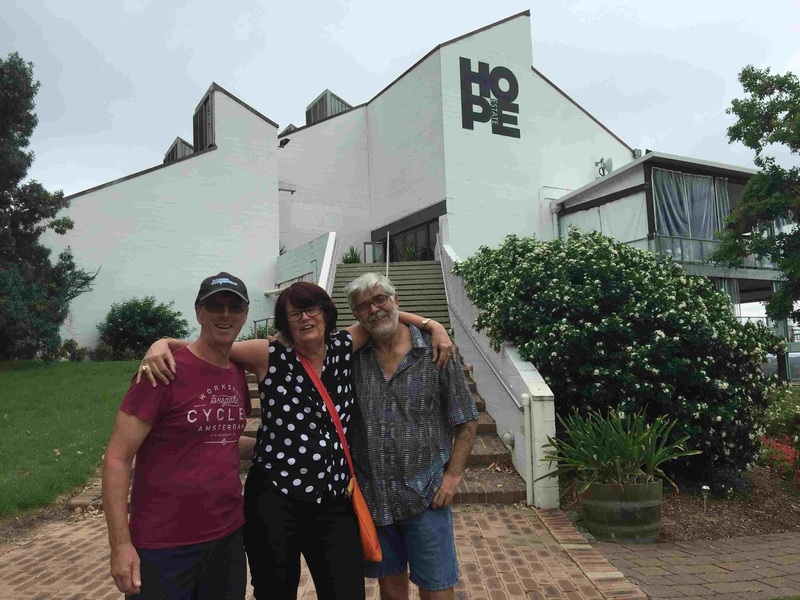 bushfires meant that it was too dangerous to go. We worked out our last visit was in the late 1970's. With temperatures forecast to be in the high 30's, we thought we would leave Chaffey Dam and head to power - mainly to run the air-conditioner. Temperature during the day got as high as 42 in Singleton. 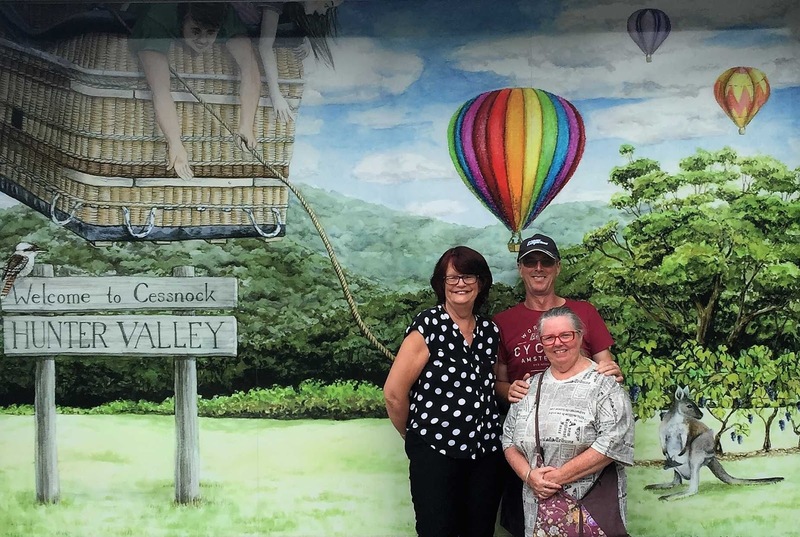 We headed to Cessnock Showground, originally for two nights, but stayed for three. At $20 a night with power and water it was a bargain. After arriving, we stayed in the cool of the van until early evening, before coming out for drinks with our friends Steph and Eddie. The next day, first stop was the information centre, then off to the wineries we went. 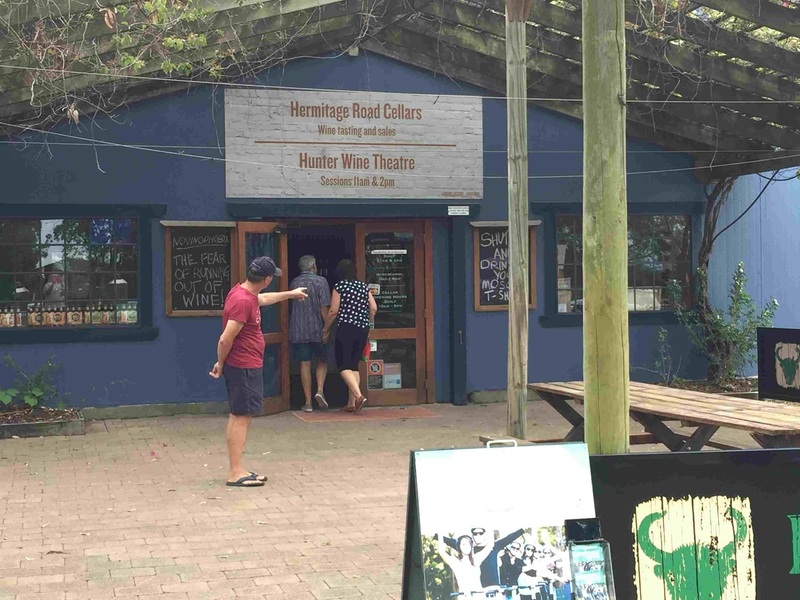 Hermitage Road Cellars was the only winery we actually had a tasting, and it is great to see that sweet wines like moscato, are making a comeback. 40 years ago Moselle was all the rage, and I like sweet wines. 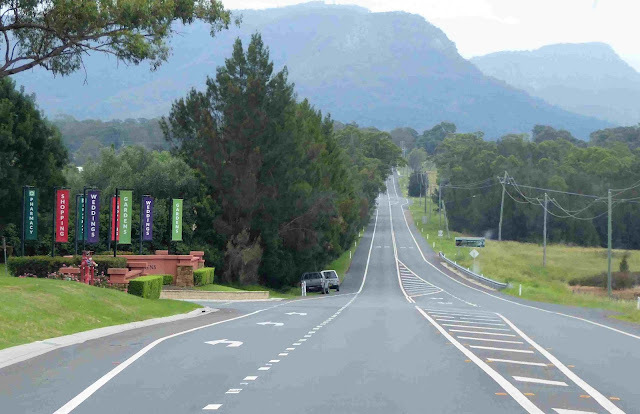 The Hunter Valley was established, so history forms part of the charm of visiting the area. 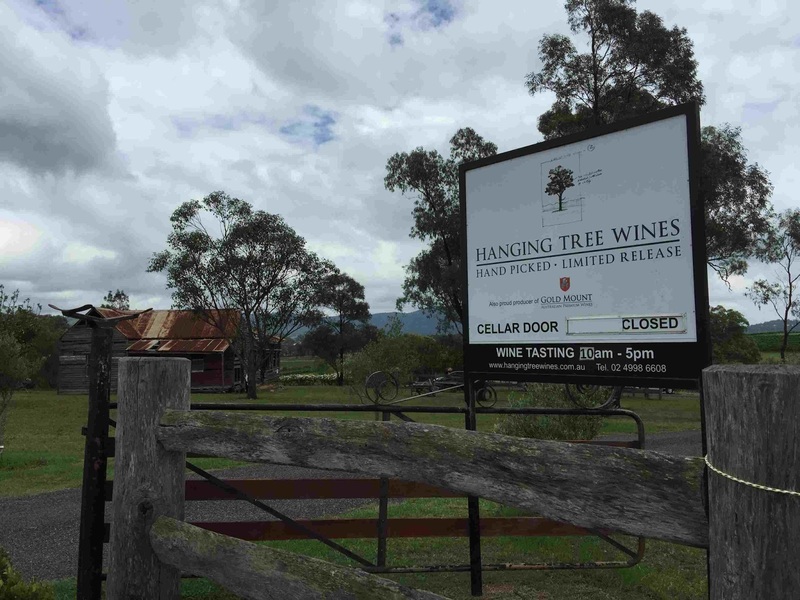 One winery that has embraced the history, and even promoted it is Hanging Tree Wines. The old blacksmiths shop is near the gate of the winery. 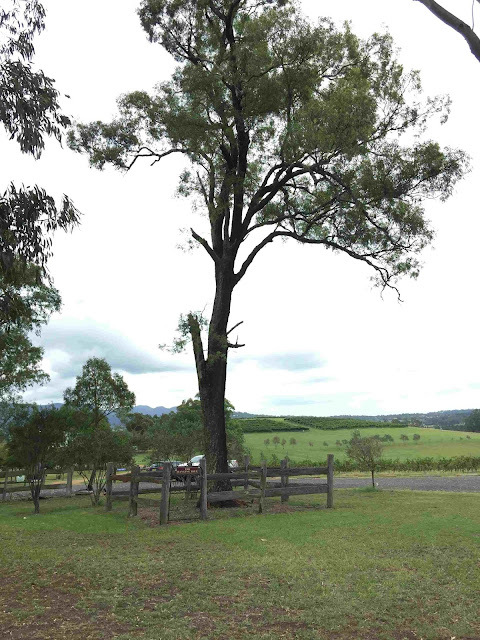 ..and not far away is the hanging tree that the property is named after. 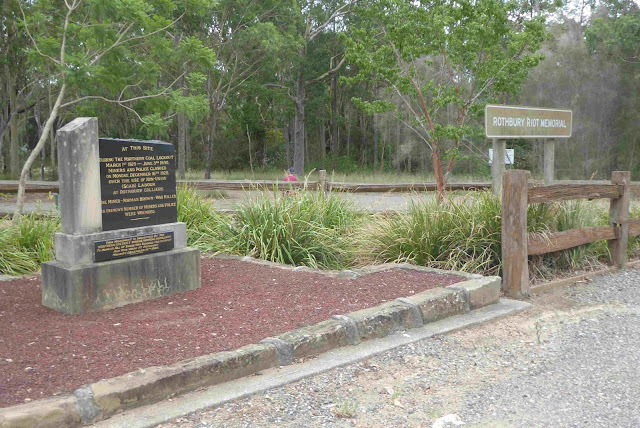 The hanging tree was where local meat was hung, but it is believed that a bushranger or two may have also be hanged there. 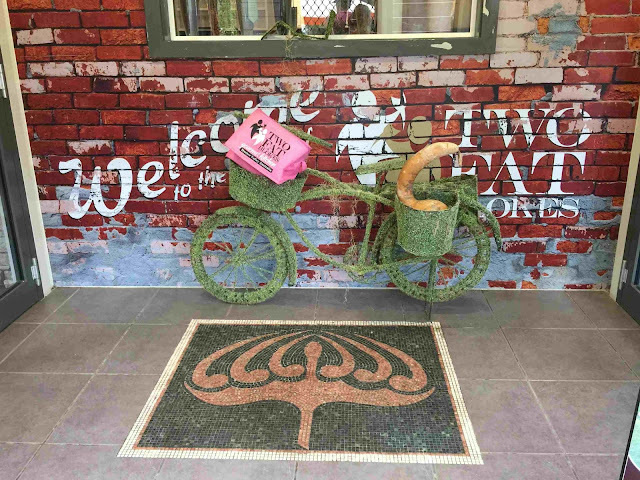 There are so many wineries in the Hunter, but like the Barossa, we didn't do a lot of wine tasting. Peter doesn't like wine and I know what I like. It was interesting to see the history of the Hunter Valley wineries. 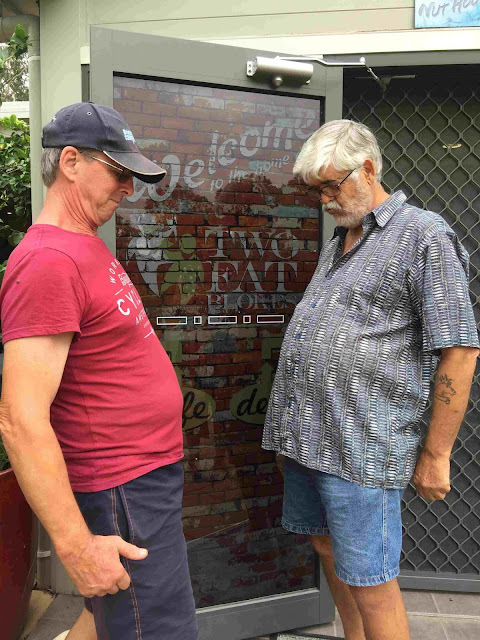 Our two fat blokes (not really) out side 'Two Fat Blokes'! 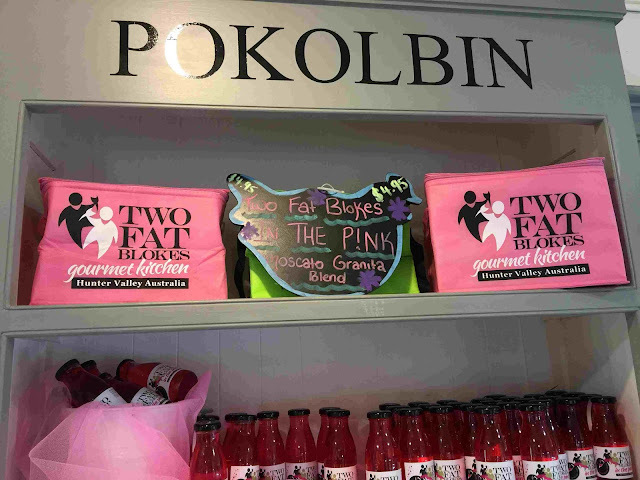 Pokolbin is the main area of the Hunter for wineries, and it would take days, if not weeks to visit them all. 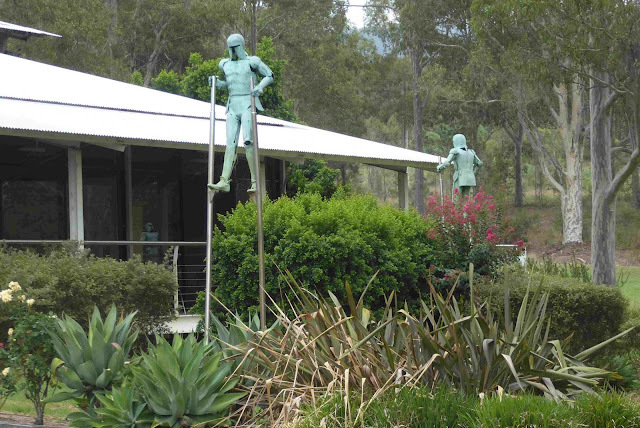 Some statues outside the function area of Two Fat Blokes. After visiting a few wineries we headed to the small village of Wollombi. Wollombi was settled in the 1820's and is located on the Great North Road built by convicts, including one of my ancestors, Isaac Perrett. 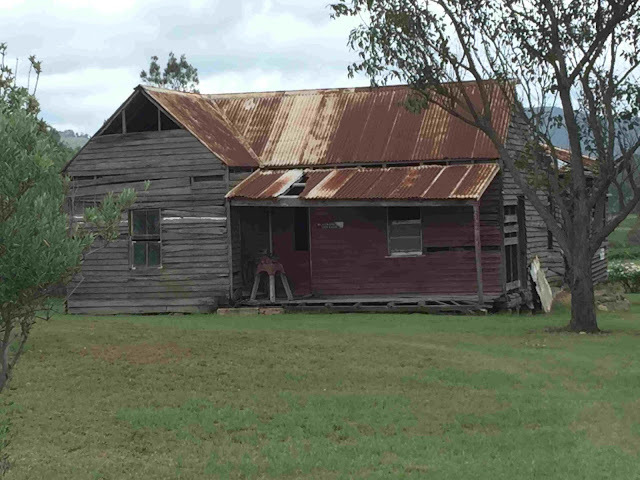 Wollombi was where one of the colonial general stores was set up to supply the soldiers and convicts working on the road. 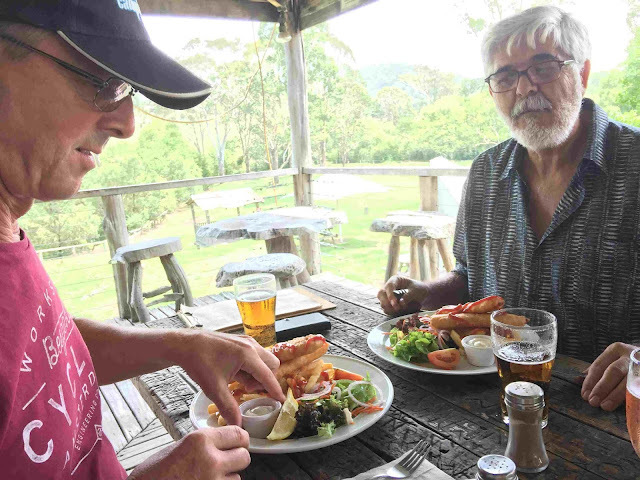 There are a lot of convict relics and tunnels in the area, but we didn't have a lot of time to explore, as lunch was the objective of the visit. 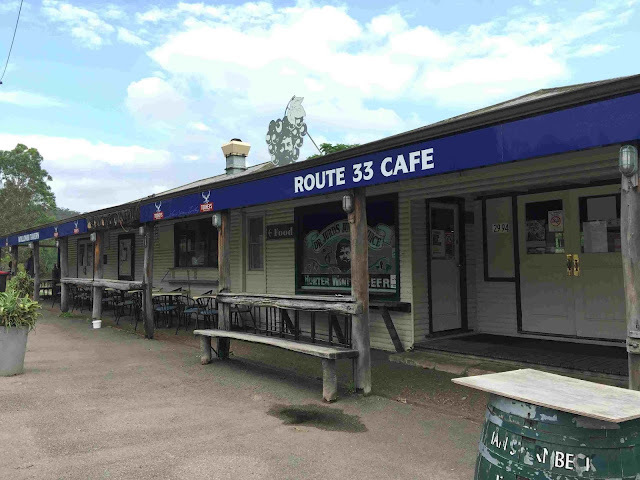 The pub Route 33 Cafe was a perfect choice. We all had the $10 lunch special of fish and chips, and boy was it big and so tasty. We could have easily shared one between 2. There is also free camping out the back. Our friends went back there on Friday for a concert, while we headed for the coast. The following day Peter and I visited some family tree sites. 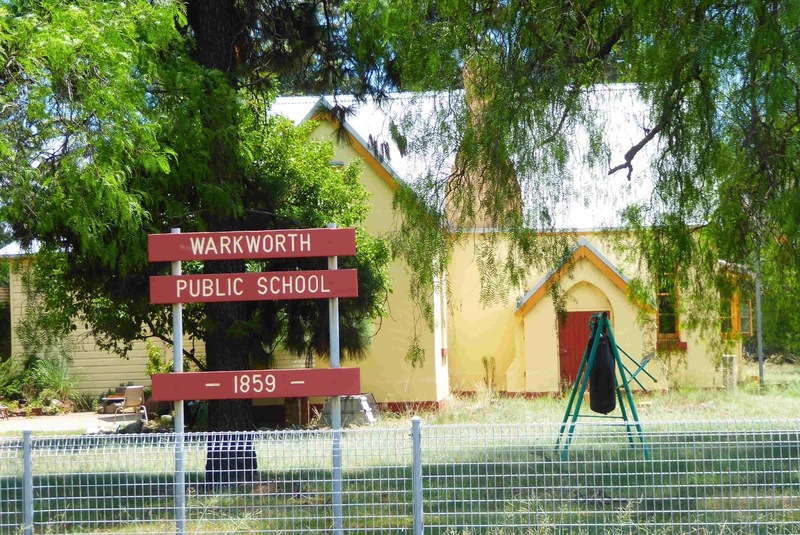 First place was Warkworth, west of Singleton. All that is left of the original village is the school, and the church. 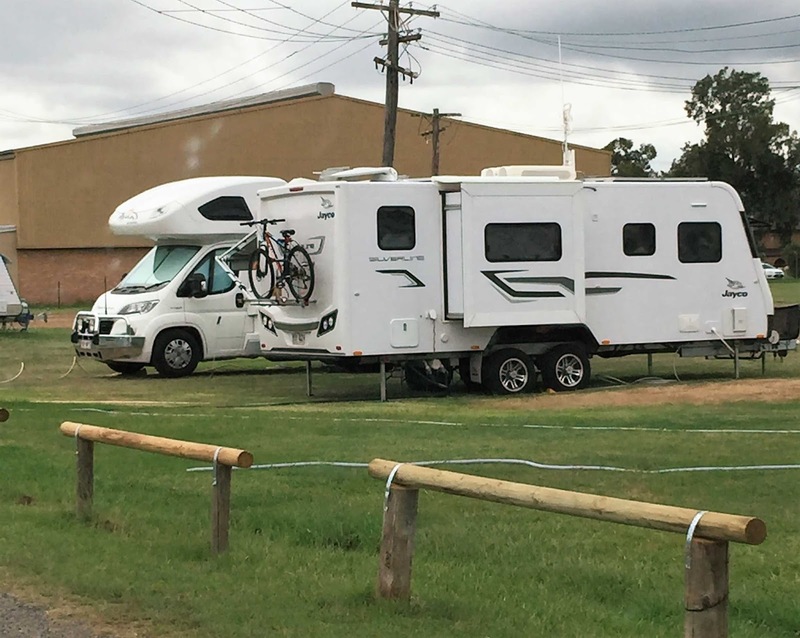 The local oval is a free camp for travellers. I don't know if any of my Perrett's or Brown ancestors went to the school. The school was built in 1859. St Phillips Church is where my ancestors John Perrett (son of Isaac) and Isabella Brown married. 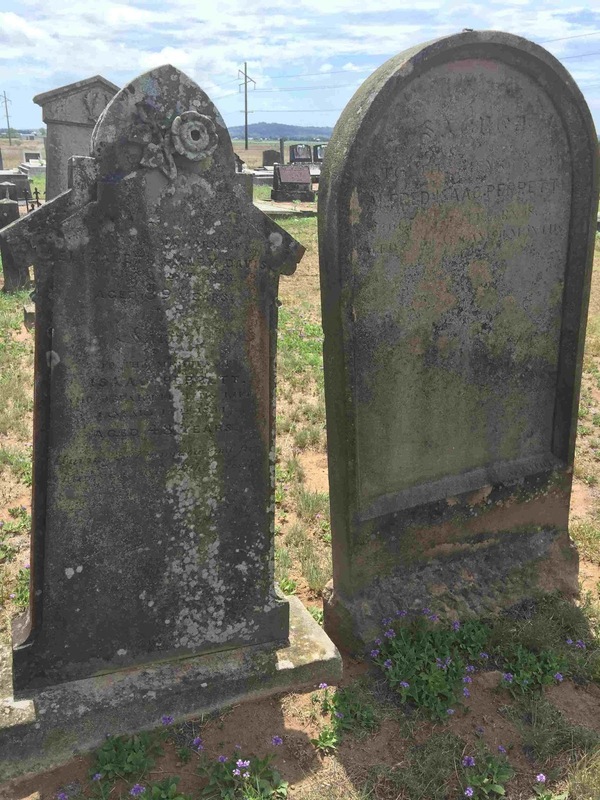 We had lunch at the oval and then drove to the east of Singleton to Whittingham and the cemetery where Isaac Perrett was buried in 1841, along with his son Alfred Isaac Perrett 1862, and daughter Elizabeth Mary Davis nee Perrett 1876. While driving around the area we came ac the Rothbury Riot Memorial. 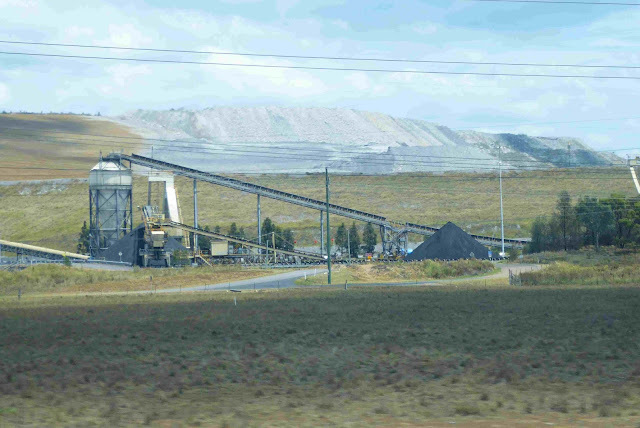 I never knew that coal mining was in the area. Early 1929 mine owners wanted their workers to accept new, unfair, work conditions. When the miners refused on 2 March 1929, they were locked out of their jobs. In September 1929, the NSW government made it illegal to gather in groups. On December 16, 1929, about 4000 miners assembled at this spot. Police arrived and shots were fired into the group to make them disperse. One miner was killed and 45 were injured. I never realised that coal was an important part of the Hunter Valley, although I did know that Newcastle was an important coal port, I just never connected the two. Sounds like you had a great trip, and it's always so nice to meet up with friends. That's a lovely photo of you. Robin is a bit of a wine buff, so would have loved to do the wine tasting. I don't drink wine - it tends to give me a headache!